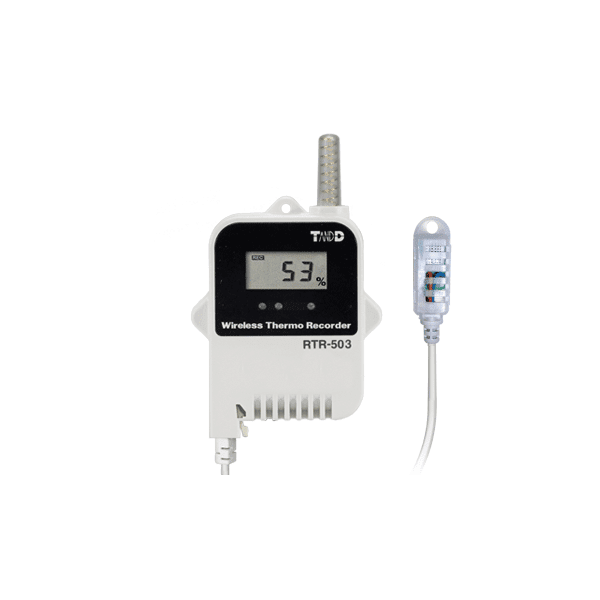 The RTR-503 Wireless Temperature Humidity Data Logger – Download data via communication with a base unit. Recorded data can be downloaded from the RTR-503 data logger (Remote Unit) via wireless communication with a Base Unit. The wireless communication range between a Remote Unit and a Base Unit is about 150 meters [500 ft]. By registering an RTR-500 as a Repeater, it can be used to expand the wireless communication range. 16,000 readings means you can record every one second and still log four and a half hours of data, or at a recording interval * of 60 minutes you can keep logging for 666 days. A Base Unit can download via wireless communication one RTR-503 Remote Unit at full logging capacity (16,000 readings) in about two minutes. The RTR-503 Wireless Temperature Humidity Data Logger uses one Lithium Battery (LS14250). At normal temperature, if recorded data is downloaded once a day or if monitoring is carried out once every ten minutes, the estimated battery life will be about ten months. Model names which include “L” are designed with a large capacity battery pack. Under the same conditions, L-type models will continue for about four years without the need to change the battery. The RTR-503 allows for a variety of commercially available sensors to be connected to the included Input Module. Recording Mode Endless: Upon reaching logging capacity, the oldest data is overwritten and recording continues. * When using RTR-500GSM, RTR-500NW or RTR-500AW as a Base Unit, only “Endless” can be selected. Wireless Transmission Range About 150 meters (500ft) if direct and unobstructed. Wireless communication : about 2 min. The Settings Utility application is used to take care of all Base Unit settings and registration of Remote Units and Repeaters. After having registered and placed the Remote Units and Repeaters in the field, it is possible to run communication tests to check signal strength between the various units to ensure stable communication. The Operation Guide that is part of the software uses easy to understand terms to help lead you through all the necessary steps and setting procedures. If during setup you get confused or have trouble, just simply open the Operation Guide in the same on-screen window and make settings while consulting the Guide. When using the RTR-500GSM, we have included an “Initial Settings Wizard” which guides you through what otherwise would be the difficult process of setting up the unit for GSM network communication; just put in the SIM Card and turn on the Wizard. With either program you can view up to eight channels of data in one graph.The Graph programs intuitive operation allows the User to easily hide or view channels, zoom in and out on data, switch back and forth from °C to °F, and view data in table form. Graph data can be easily viewed as a data list. The highest and lowest values are shown in easily distinguishable colors. It is possible to hide, re-order and delete channels, edit recording start times, and make changes to colors used for the graph scale lines, data lines and background. measurement. The RTR-500 Series Software allows for adjustment settings to be made to Remote Unit measurements by simply selecting the adjustment method from either “1 Point Adjustment” or “2 Point Adjustment” and entering the values for “Before Adjustment” and “After Adjustment”.